Design is a process. The collection of ideas. The ablity to aesthetically arrange content and draw the user into the experience. WebDesign is different in that, the end product is presented on electronic web pages. The end–user accesses the information, the finished project, through the internet via a web browser of their choice. 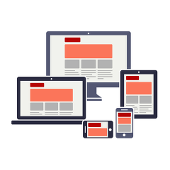 How does your current webSite compare to the 10 Web design trends you can expect to see in 2015. I offer a free consultation. Is it fluid? Responsive? Elastic? I agree it can be a bit confusing. The bottom line. With smart phones overtaking desktops for users, it is wise to consider the investment in your webSite. A design that delivers perceptive user–interfaces regardless of the size of the display or device. Solid coding skills are of great value — if not vital, as “Responsive Web Design” demonstrates it is no longer practical to provide a Photoshop mock–up. We all have it in our lives. We all expect it. Most of us want it at some level. I will integerate social media platforms into your project. How much and what you want is up to you. This includes e–mail marketing solutions such as MailChimp or Constant Contact. Check out vCita. A little or a lot? What you want!